One of the biggest reason why non-Apple users tend to keep distance from the brand is their doubts and fears about synchronization. You can't be unaware about the common fear that runs among non-Apple users that you have to buy music on Apple – you just can't make it travel from your laptop to your iPhone. I mean even if that isn't entirely true and even though Apple seems to be busy encouraging abstinence from piracy, what non-Apple users think can amount to anything. And when we talk about synchronizing your Apple device, copying contacts is something a newbie is afraid he or she won't be able to manage on their own. Not just copying, but also maintaining your contacts. Most people still don't know how to sync their Macbook contacts with their iPhone contacts and how to use iCloud to help you out. And as if syncing was the only trouble, managing stuff on your Macbook can be a trouble too, that's what some people say. Even though I don't entirely agree, for the people who find managing contacts a challenge, here is a must – have application for you. The Contacts Manager app is an application for Mac. A utility app, Contacts Manager was launched about a year ago. With a small size of 5.2 MB and a price of Rs. 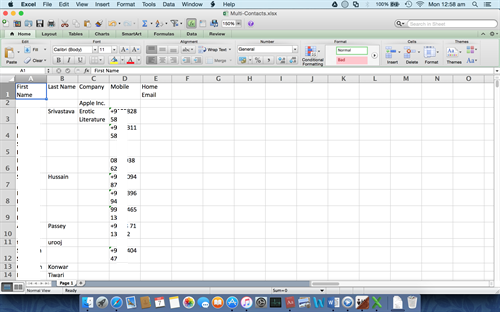 190, this application was developed by Enolsoft Co., Ltd and runs on the latest version of Mac that is the Yosemite. The feature set of this application isn't huge. All I would say is it does mostly everything you can expect a paid contact management app for Mac to do. Though the interface of this app doesn't make for the most stunning Interface a Mac app can have, it's pretty simplistic and seems like a no-boast, minimal show off application whose developers only believe in utility and no spoof. When you open the app, the first thing you get to see is your contacts listed out. 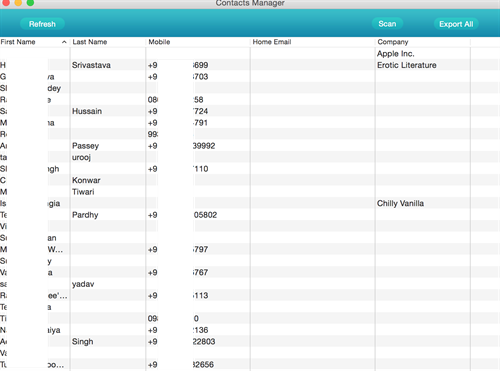 You can see the first names, the Last name, Mobile, Home Email and Company as the headers in the table. 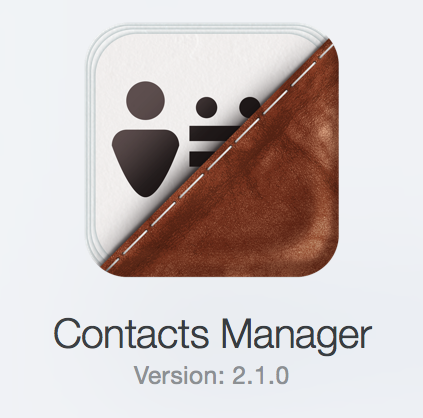 The Contacts Manager app lets you export and backup your contacts in a number of formats. If you value your contacts more than anything and are afraid of a calamity your system might face post which you may lose contacts, the Contacts Manager app lets you export all your contacts in 9 different formats which include the CSV format, the much shareable vCard format, the simple TXT format, the Word document format which is the Docx, the HTML format so you can see your contacts even in your Browser, in Pages, Numbers and most importantly, the very portable Excel format. So that would amount to a total of 8 formats supported. Feel like having realized the investment already? Who likes duplicate contacts that accumulate because of changing sim cards or copying and recopying contacts from one phone to another? All that could have possibly happened when you didn't have an iPhone but still, wouldn't you like to clean up your Address book? Though you could have done this using the Contacts app that comes built in with the Mac but since you're paying, you must have all the options right at your doorstep. So if you want to delete a duplicate contact, all you have to do is double tap on the touchpad (for those who don't have a Mac, the double tap is your Windows' Right Click in Mac) and select Delete. It looks as simple as this. Now if you want to delete one or more contact fields for your precious contacts, doing it is a one step process with the Contacts Manager app. 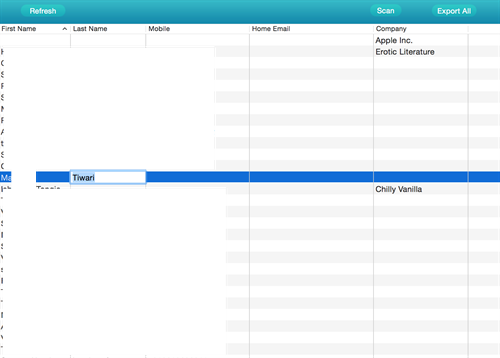 You can edit contact fields like Contact name, email address, phone number, etc. in one go. All you have to do is hover the pointer at the desired contact field and double tap on the touchpad. Post that you may change the details to whatever you choose. With the premium paid Contacts Manager app, you can add properties to your contacts, which will include contact address, email address, phone number and so on and so forth. It is imperative on any app that you don't face unnecessary trouble because you were using it. And who would like that when you are shelling off considerable amounts of money which you could have spent in buying the game that just won the Best Design award or something? With Contacts Manager app, you don't have to fear that your contacts will get shuffled or or something or fall into a state of mayhem and chaos. No! That isn't going to happen because the premium Contacts Manager developed by Enolsoft synchronizes with the Built-in Contacts app that comes with Mac without giving you bumps. So all the changes that you make, be it deleting your contacts or editing contact fields, it's all synced with the built in Contacts app instantly. So you don't have to worry how that will happen. In fact, it is much guessable when you know that the list of contacts it imported in the first place was done through the built in Contacts app. Hurray! Trust me when I tell you about this: Now this is the feature you actually chose to shell off your 3 precious dollars for. The Contacts Manager app lets you scan your contacts for various types of problems. These problems may range from anything like presence of duplicate contacts, or presence of duplicate contact properties like postal address, bad suffix, badly formatted names or invalid and unusual characters used in the Contacts. Here is how it looks. The most interesting part is it lists down the troubles your contacts are impregnated with and also lists the possible solutions for you to review, fix or remove. You can click on the Fix button or whatever and get rid of the issues your contacts are facing. Here is a list of all the problems this app fixes up for you. 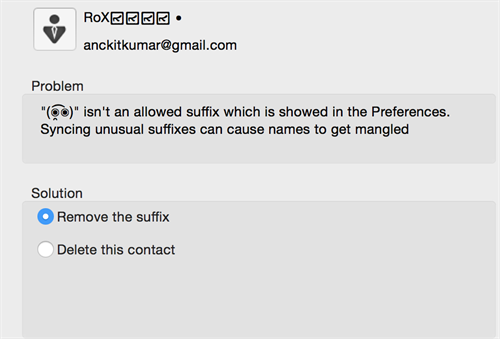 Unusual suffix - If your contact has an unusual suffix, this app fixes it up for you. If you have an unusual suffix, it'll be listed out on the left panel and you will get a description of the problem. 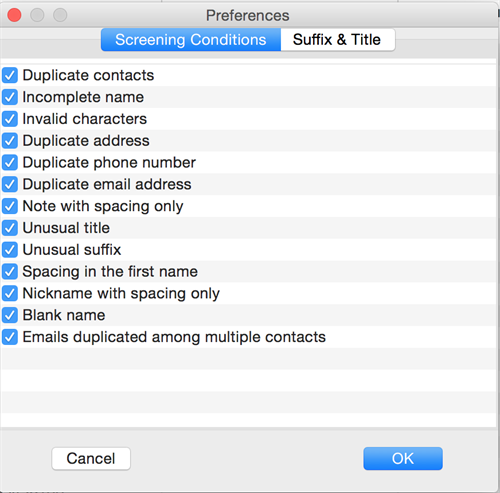 A typical 'Unusual suffix' description said: "(New Email) isn't an allowed suffix which is showed in the Preferences. Syncing unusual suffixes can cause names to get mangled. Now you have two solutions for the problem which are removing the suffix or deleting the entire contact. 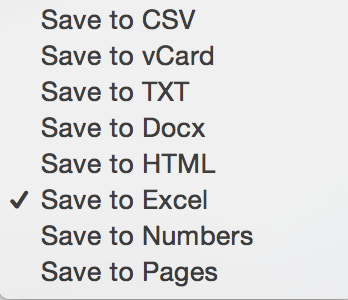 You can choose the option you want to go with - removing the suffix or deleting the contact and can click on Fix. Here is a list of suffixes and titles this app allows for your contacts. Unusual title - A typical contact with an unusual title would be screened by the App. 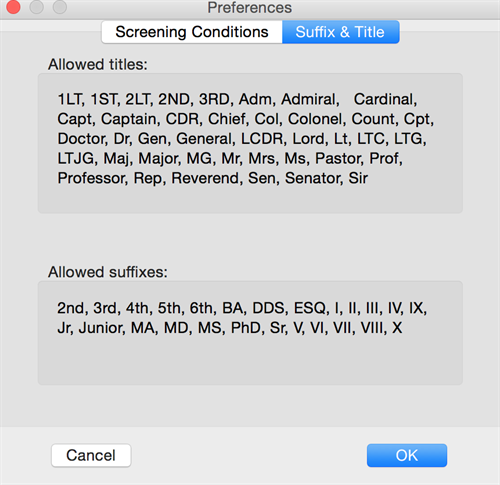 A sample description said: "Dr. isn't an allowed title which is showed in the Preference. Syncing unusual titles can cause names to get mangled. The available solutions are removing the title or again, deleting the entire contact. Incomplete Name - If your contact does not have a full name which means that the first or last name is missing or is blank, the app will take care of it. The possible fixes available are converting the contact to a company contact, using '???' instead of empty names or deleting the entire contact from the list. 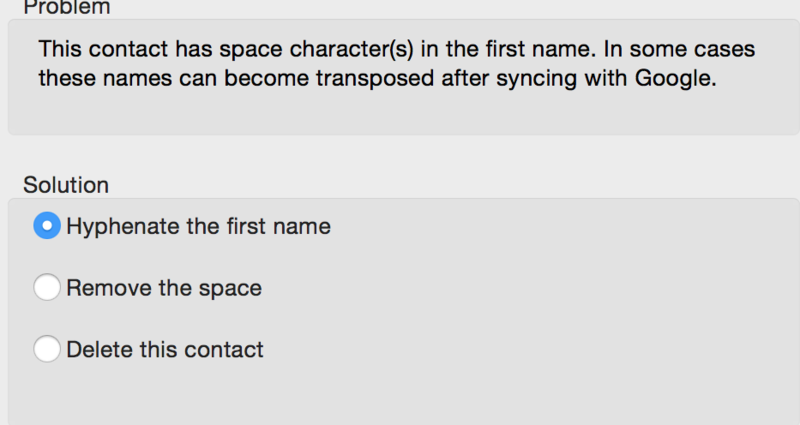 Spacing in the first name - A contact may have a space character in the first name. The description says that in some cases these names can become transposed after syncing with Google. 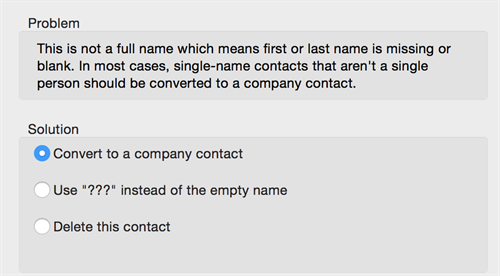 Possible fixes you have are hyphenating the first name, removing the space or deleting the contact. 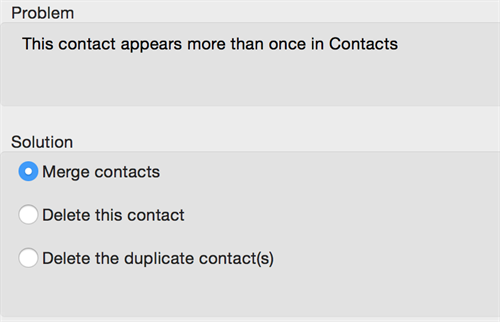 Duplicate contacts - There you go with the biggest headache contact management can give you. You can merge duplicate contacts, delete a certain contact because it appears more than once in the contact list or you can as an alternative to these solutions, delete the duplicate contacts. Blank Name - A Contact may have a blank name too. 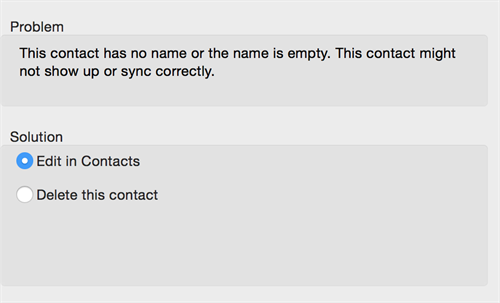 You can edit the contact in Contacts or can delete the contact as the solutions. 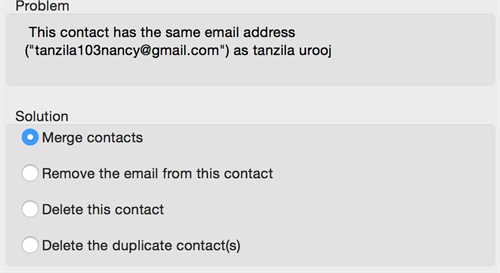 Share email address - If more than one of your contacts have the same email address, the app detects it for you and lets you merge the two contacts, remove the email address from the displayed contact, lets you delete the contact or the contact that are the duplicates of this one. 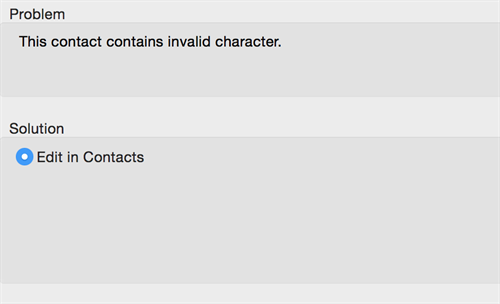 Invalid characters - Lastly, a contact can have invalid characters, which you may edit in contacts. And that happens with a single tap. Feel like buying the app right away? The app like I told you comes at a price of Rs. 190 but we got a review coupon so we could let you readers know what this app can do or what it can't. If you ask me, I'd say that it does mostly what it asks you to pay for it. The only shortcoming I could find was the not so attracting interface. The automated problem detection facility was something fancy and on the top of my list for premium features. Honestly speaking, most people would turn it down considering it's a paid app. They would rather choose to buy a game or maybe a photo editing app. That's what most people would do I suppose. But then if you are a professional and like to keep your address book clean, why wouldn't you go for it? So I'd say, this app does seem to have a future. The automated problem detection facility has set me up. Maybe I'll buy it for my cousin. Buy the app if you haven't already, I'd say, all in all, for it won't disappoint you.